Real Pirates, Real Stories, Real Fun! This energetic tour is highly entertaining and fun. You will laugh and learn. We are historically accurate and hysterically entertaining. Our Pirates, along with the French Quarter as the backdrop, will make for a truly remarkable New Orleans experience. The Captain and his crew are going to tell you what life was really like for a Pirate in New Orleans in the early 1800’s. You’ll hear about the sword fights, the smuggling and the rum. You’ll learn about the pirate’s involvement in the Battle of New Orleans, customs, traditions, more rum and you will find out where the treasure is buried! What is the cost? The tour is $25 for adults, $15 for kids 6-11. 5 and under are free. Reservations Required. Where do the tours start? Regular tours and Pub crawls start at: 533 Toulouse St. Please show up 15 minutes prior to start time. Look for the pirate. How long is the tour? The tour is about 1 1/2 – 2 hours long. Is there a lot of walking? No. You’ll walk less than a mile with many stops along the way. There’s also a bathroom/drink break halfway through. We can have a maximum of 28 people per tour. Large groups can be booked on other days and times with advance notice. Email: [email protected] or call: (504) 442-3409 for more information regarding our pirate tours in New Orleans. A super fun and educational walking tour. This was like no other walking tour I have ever done. It was super fun as well as educational. We learnt a whole bunch of stuff about New Orleans and the French Quarter. The Captain and the Quartermaster were able to confirm or bust many myths and stories about the Quarter. We were able to smile quietly to ourselves on later tours. The Captain and the Quartermaster were really entertaining and informative and we had a really great time on our tour. It was my favourite thing I did in the French Quarter and I highly recommend the walking tour! Not only did this tour have me hanging on to every word it was a good time. Loaded with tons of cool information, interesting facts, and Cool Pirates. This tour was amazing. I highly recommend it. It shows they really did their homework!! Justin M. – Atlanta, Ga.
Best tour in New Orleans! I had an amazing time on the Pirates of the Quarter tour. The captain and the quarter master are very knowledgeable of the history and keep it very entertaining. I learned a lot of great information and history. I was not ready for the tour to end! Recomand anyone that is New Orleans to take this tour!!! The BEST tour in NOLA! The Pirate Captain was super knowledgeable, fun and funny. We know a lot about pirates and we still learned things that we didn’t know. We took the 18+ tour and we got to hear all the dirty deeds that went on in New Orleans in its early days. Definitely a must do! A great tour! Lots of interesting history of the quarter. The Captain looks and acts every bit of the part. He was entertaining and you could tell he did real research to make it authentic. It was a unique perspective of the lore and tales of the quarter. The walk was easy, just under a mile and we were glued to every word. A must do for something different than the usual tours. This is the best tour in New Orleans and well worth the time and money! There’s no better way to see the French Quarter and learn about the real history of pirates and other colorful historical figures and events! It’s an easy walk and suitable for all ability levels and ages. There’s even a few stops at the local watering holes if you get thirsty! I highly recommend you take this tour whether or not you’re a seasoned New Orleans veteran or a first-timer! The Captain knows the real history of pirates in New Orleans! This tour was lots of fun and factually accurate. I’ve been on several French Quarter tours but learned a lot on this one. And how can you not have fun with a pirate! The price was low and the walk was easy with at least one bar along the way. Absolutely enjoyed it! I’m now back at work and the boss is wondering why I’m wearing an eye patch and have a parrot on my shoulder. It’s because…I WANT TO BE A PIRATE! Thanks Captain for giving me back my sea legs with an awesome tour. 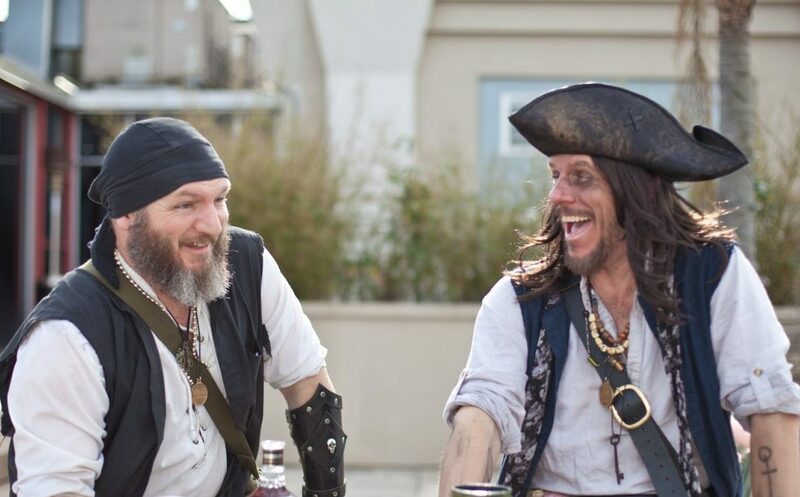 When in New Orleans…share some rum with The Captain and learn why pirate history is so important to New Orleans and perhaps the country as we know it.